Hey, old timers out there, who remembers Kamals? My first taste of his food was from a truck, parked in a lot on Bank Street. But years ago Kamal also had a restaurant in the Glebe, which he then moved to Somerset Street Village when Le Métro moved out, and then to the awkward little avenue off Carling Avenue just west of Woodroffe (where you now find Pookie’s Thai) – before finally calling it quits – taking retirement. “Taking it easy,” his sister tells us. She is the mother of Naji, and Naji is the chef here. His wife and parents serve. So, while it’s not Kamals returned to his old Glebe stomping grounds, it is his nephew and family. The Naji walls are the colour of sand. The ceiling is the original press tin. Bands of old brick have been left exposed. But other than the chrome cedar tree at the back and some potted cactus on a wall, there’s not much here that sets the cultural context. Just over a year old, Naji’s opened and was pretty much immediately a victim of the Bank Street construction. Now it’s been uncovered, it only needs clients. What it offers is a steep step up from the prosaic Shawarma places you find in malls around the city. And how nice to see Lebanese food elevated once again from its fast food subsistence. It’s been so long since Lebanese dining was fine dining (remember Fairouz?) with its herbaceous pleasures, its understated spicing, the acid of lemon, the pungency of garlic, the balm of good fruity oil, the tartness of yogurt, the earthiness of bulgur, all subtly blended. It may now be as close to Lebanese fine dining as you’ll find in this city, but it could go further. What Naji’s does it does well. I love the dips – the richly flavoured hummus bi tahini with its puddle of green oil, its olives and beet-stained turnip sticks (clearly made in house); the thoom (a garlic dip thick with puréed potato) the tangy yogurt dip. 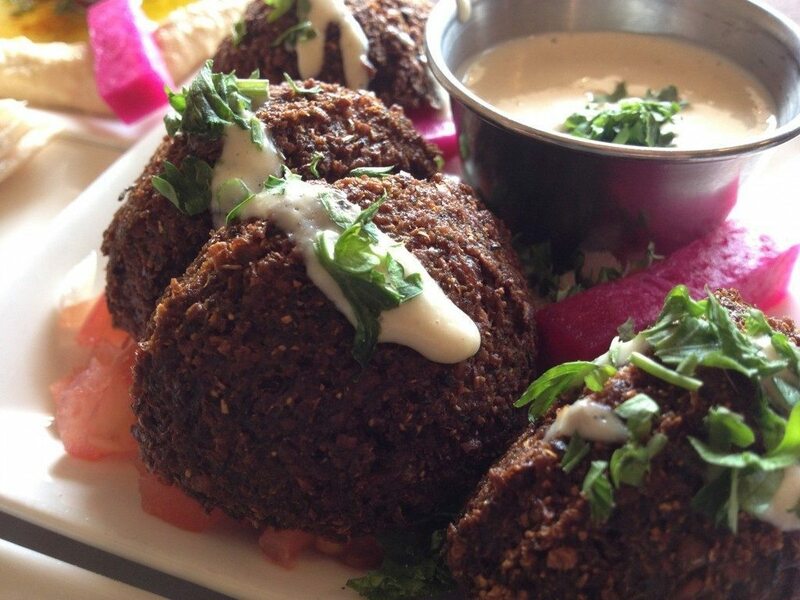 These are simple, comfort foods, served with warm pita. Take the mezze platter on offer for a spin – a generous serving of dips and bread, tabbouleh salad and freshly fried falafel, with that satisfying crunch, the inner guts soft and well spiced, on a platform of tomato, served with tahini. Don’t expect to find bulgur in the tabbouleh. This is a very green mound, all chopped parsley, tomato, garlic, lemon and oil. We don’t much miss the grain (some would be nice, to give it that mix of texture, that earthy crunch) though we do miss the mint. Still, it’s got zip and zing, is perfectly seasoned, and it reeks of good health. The fattoush salad with its crisp pita croutons, lemon dressing and sprinkling of sumac is generously served. There are pita sandwiches and they are tasty – served with coleslaw and homefries. Chicken is handled with respect in the shish tawouk, the meat juicy, well seasoned – and the beef is rare, as requested, and chewy-good on its skewer with red peppers and onion. The skewered shrimp are more ho hum. 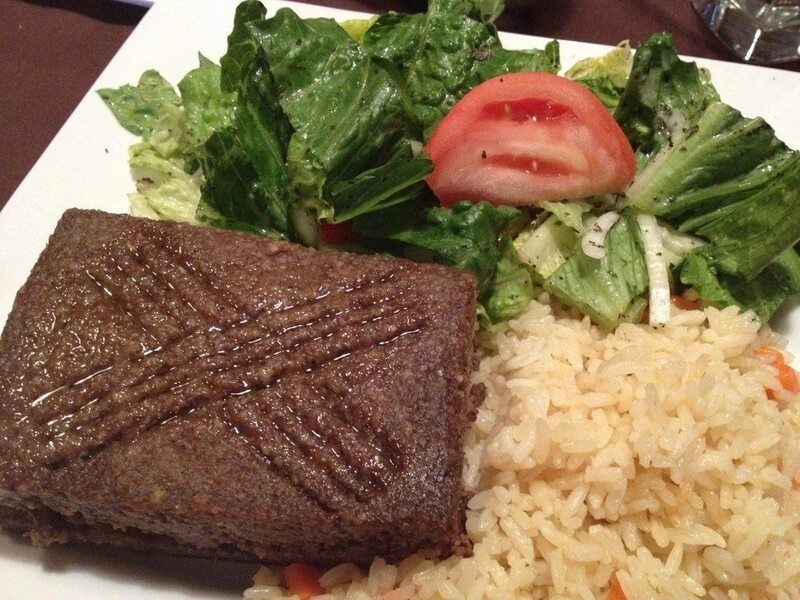 The brick of kebbeh besanieh (sic) never grades high in the looks department, but once the scored square of meat is pierced, the mix of seasoned ground beef (I was hoping for lamb) with cracked wheat tumbles away to reveal the layer of sweet onions and bronzed pine nuts. It needs the thick yogurt with which it is served, to moisten it up a bit. If I had a complaint it would be with the timidity of the menu. Where are the lamb dishes, where’s the fresh fish, the great vegetable stews? I ask. These aren’t as popular I’m told. Pity. This kitchen has what it takes to bring us more than the usual suspects. Maybe as Naji gets noticed, and busier, and we start insisting, ‘bring us some lamb!’ we’ll be heard. Delicious baklava to close, with a bit of mint tea. Lots here to like, and service is kind, charming, welcoming.